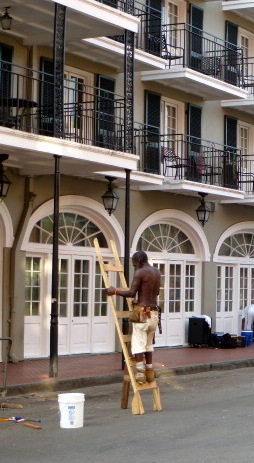 In our short and rushed visit to New Orleans, I’m grateful for the IA (intelligent/auto mode) on my camera. There was little to no time to think about photographer. Hurry up, point, and shoot was all the time I had. Son and I tried to see as much as we could in our short stay. Logan and I felt like we had traveled to another country. The architecture, the food, the accent, the landscape, the people, and of course the insects are so vastly different from most other parts of the United States. 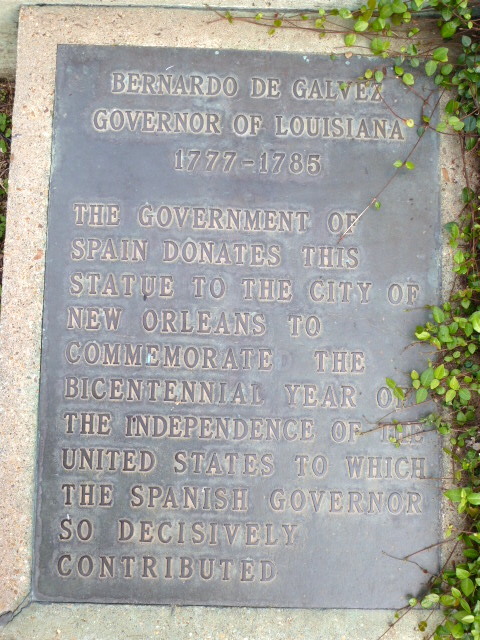 But at ever turn we were reminded of the history of this interesting part of America. At ever turn was another statue or plaque honoring the memory of someone special. We are reminded of America’s multi-cultural roots. Reminded of a Civil War. Ah, and the food, we cannot forget the food…….. Yes, New Orleans is colorful on so many levels. October 8, 2012 October 3, 2012 by Ingrid23 Comments on Goodbye New Orleans! It’s time for us to say goodbye to New Orleans. We reluctantly load the car and start our long drive back to Colorado. With a twenty plus hour drive in front of us, son and I have plenty of time to discuss our New Orleans experience. I was particularly intrigued by the buildings. 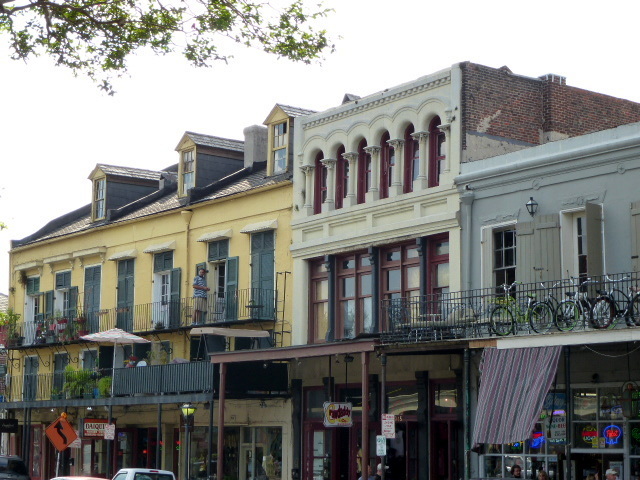 New Orleans is well know for its abundance of unique architectural styles. Wednesday afternoon, we ventured into the Garden District. 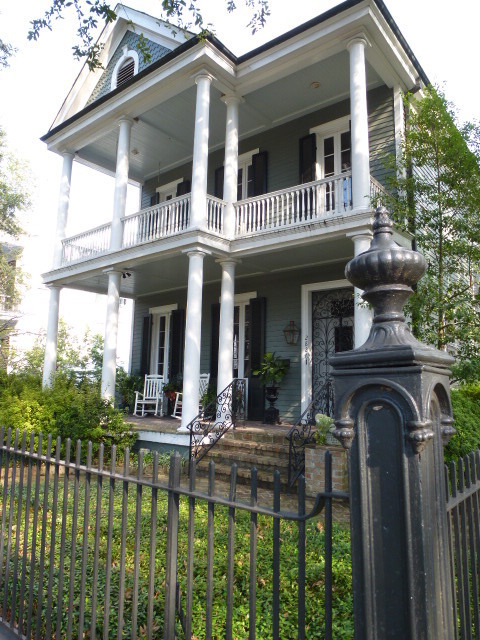 The historic and many well-maintained antebellum mansions, did not disappoint. 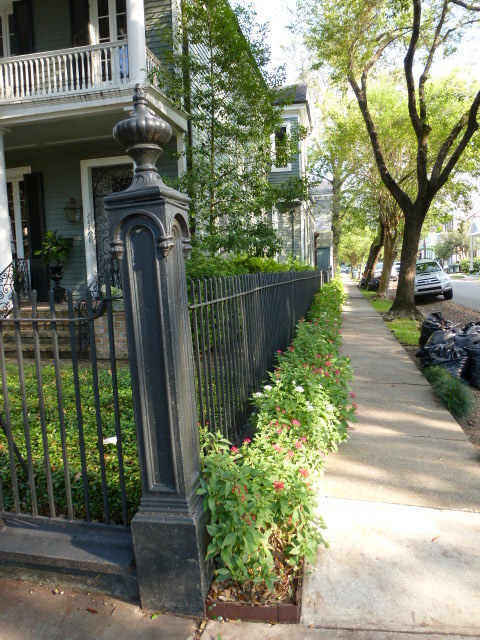 The Garden District is a residential neighborhood. During the turn of the century, wealthy newcomers chose to build large, Victorian style homes in this neighborhood along with opulent gardens. Not only were we fascinated with the structures, but also with the fencing and landscaping. This is so different from anything we see in the west, especially for Logan. He has spent the past three years living in Phoenix, Arizona, where the architecture and landscaping is so vastly different. 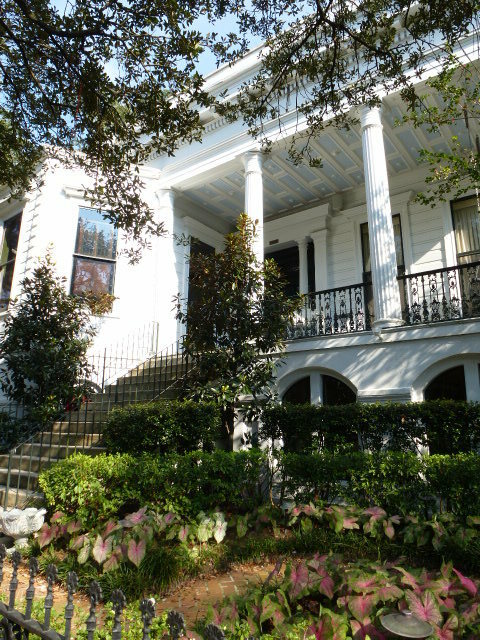 Today the Garden District is more known for its architecture than gardens. Large front porches seem to be a common element, as well as each home is uniquely painted. We see everything from white, to pink, to powder blue, to charcoal gray, and everything in between. The houses are built relatively close together. And the yards are, of course, gorgeous……lush and green with flowers galore. 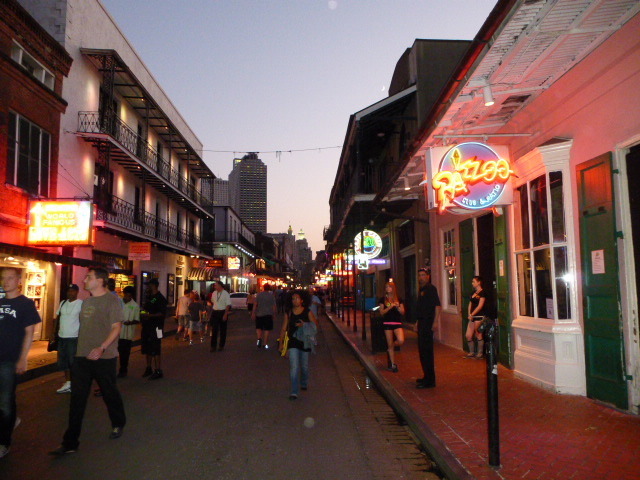 The downtown area of New Orleans appears to be divided into different categories or rather neighborhoods. 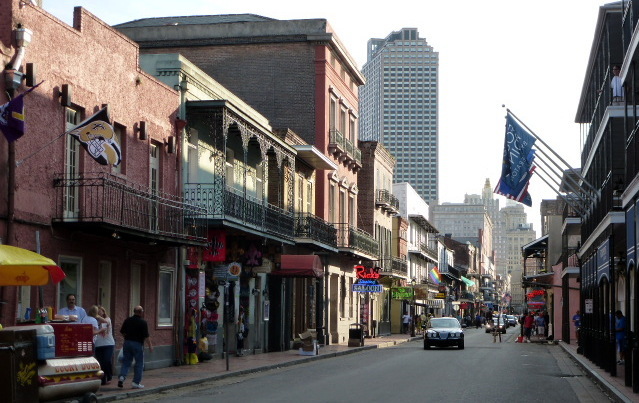 There’s the French Quarter, which I wrote about in the previous post, aka “party central” in my book. Then to the west of the Quarter is the Warehouse/Arts District. Our hotel is located within this area. Then further to the west is the Garden District. Although when I say west, what I really mean is to the left on the map. The commercial buildings in the Warehouse/Arts District are an eclectic mix of old and new. 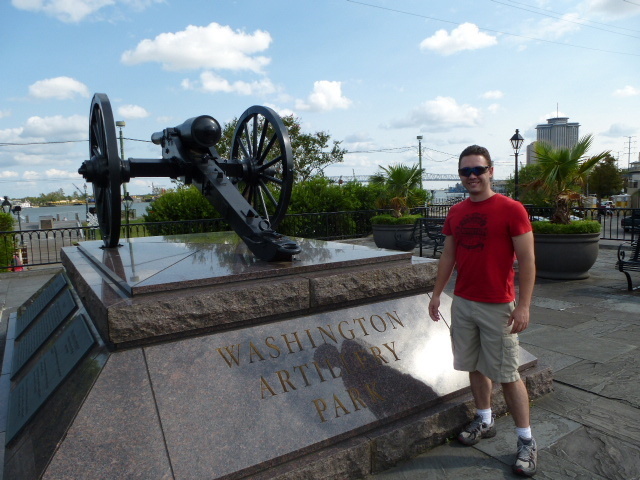 There are numerous museums in this area, including one Logan was really hoping to visit; the World War II Museum. Unfortunately time did not allow us the luxury. There is also a Civil War Museum, a Contemporary Arts Center, a Children’s Museum, just to name a few. 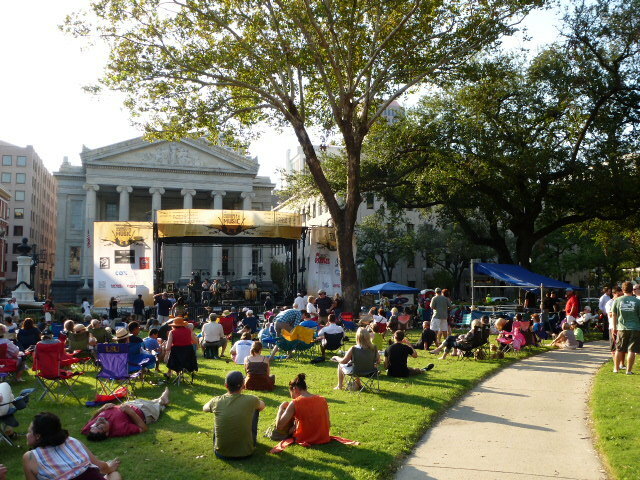 Fundraising event in Lafayette Park located next to the Blake Hotel. Our hotel room window is to the left of the statue. Federal Reserve building in background. The business district is home to the cities tallest buildings. 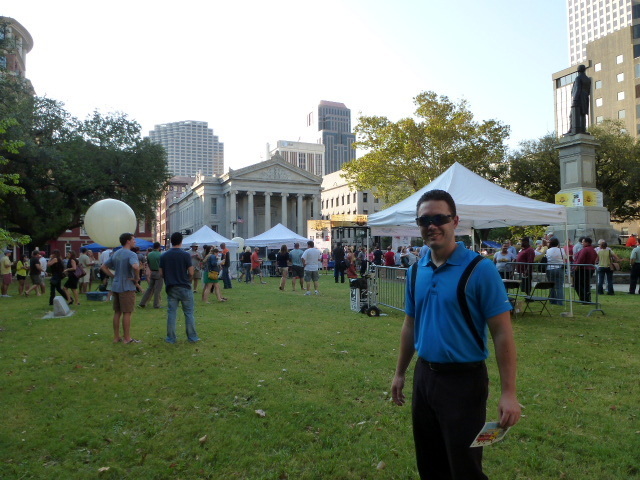 New Orleans is a rather small city and thus has a small amount of high rises in comparison to larger cities. The diverse architecture is every bit as interesting as that found in cities twice as large and that New Orleans flare is ever-present. 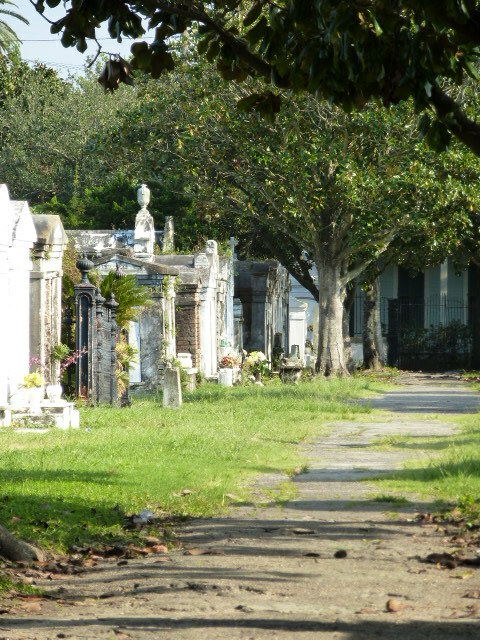 When Logan and I decided to take a walk to the Garden District, we had a destination in mind; the Lafayette Cemetery. 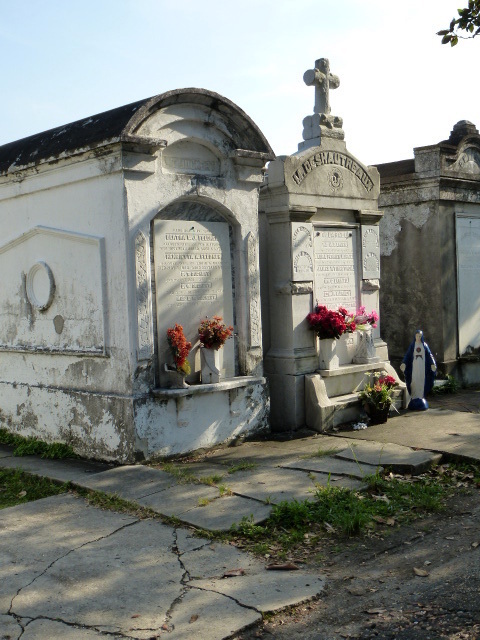 New Orleans’ beautiful cemeteries, with their distinct above-ground tombs, are attractions in themselves. 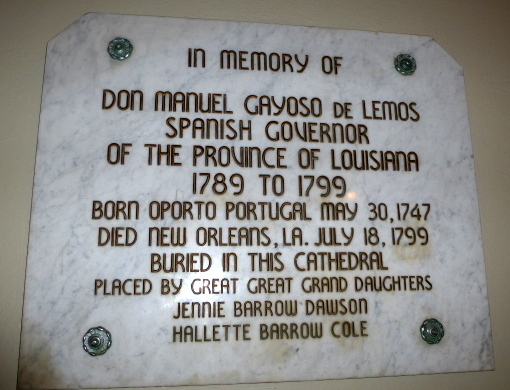 All of the graves are above ground vaults, noted for their European style and Catholic faith. Unfortunately, when we arrived at the cemetery the wrought iron gates were locked. We were an hour too late. That was fine by me, because in all actuality, I don’t think I was ready to walk through the cemetery. Just standing at the gate, shivers ran up my spine. I’m not usually creeped out like this. Perhaps its the age and/or the above ground tombs or maybe its the True Blood marathon I shared with daughter the week before. Snapping photos through the gate worked fine by me. I’d say we made the most of our 42 hour stay in New Orleans, Louisiana. We definitely intend to return with plans for a much longer visit. 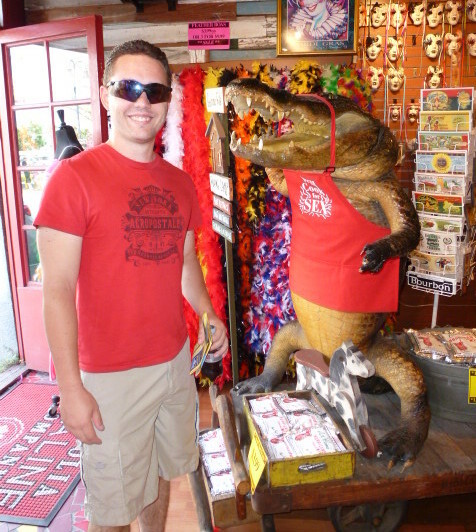 After all, we need to get in a Swamp Tour and feed some gators! 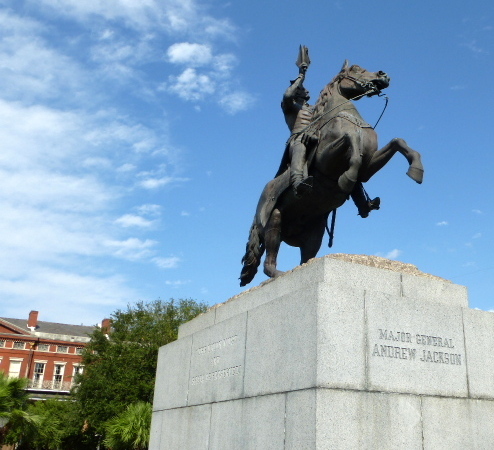 New Orleans is nicknamed The Big Easy and after spending a couple of evenings at the French Quarter I think I get it….it’s all about taking it easy, having a good time. Hey man, life’s short. Enjoy it while you can. The spray painted guy is a “street performer”. He’ll pose for photos for a donation. He and the cop are conversing like buddies…..talking about a football game. Well enjoy we did! 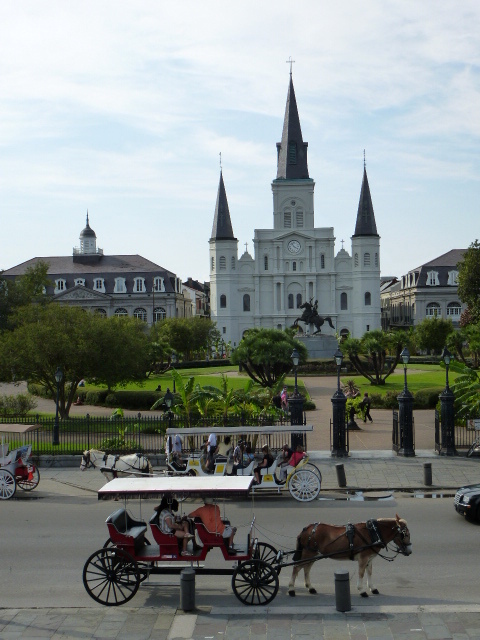 New Orleans is the largest city in Louisiana and the 46th largest city in the United States. It’s a multi-cultural city with strong French and Spanish influences. 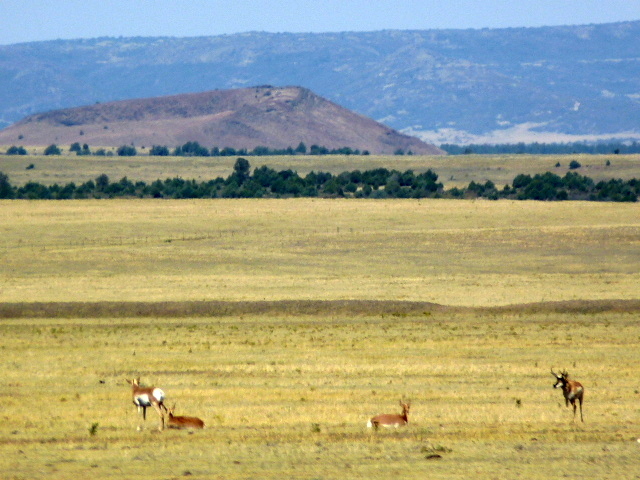 On average, the land sits at an elevation between two feet below sea level to 20 feet above sea level. 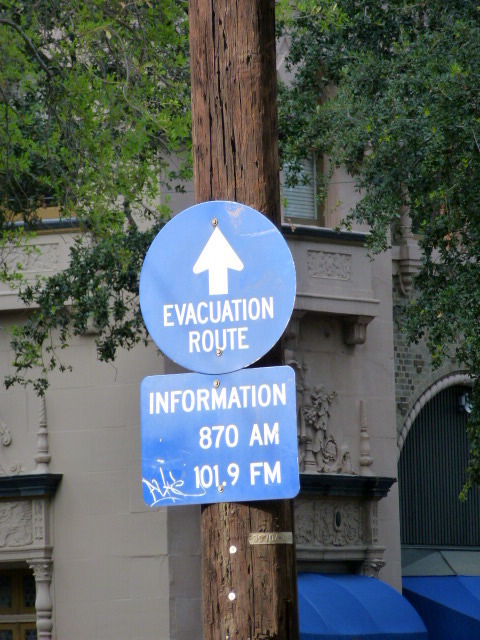 Most of New Orleans sits AT sea level. The humid, subtropical climate can feel quite warm hot. 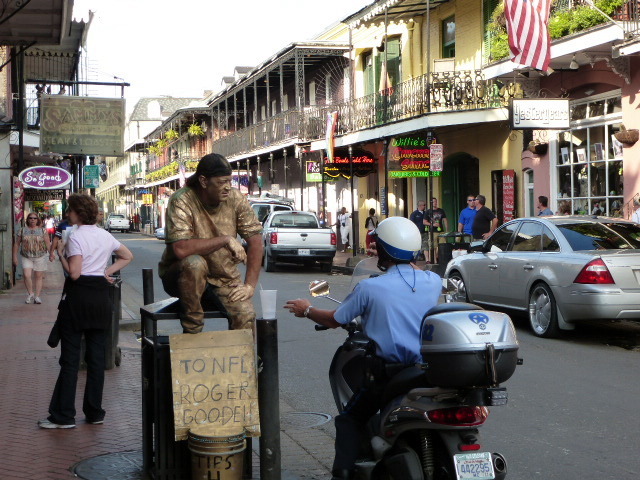 Bourbon Street….another ‘street performer’ on the left. This time spray painted silver. 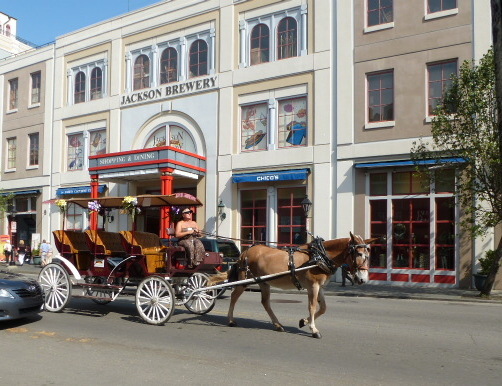 Plenty of opportunities for a horse and carriage ride. I shall spare you the image of this MAN from the front!!! 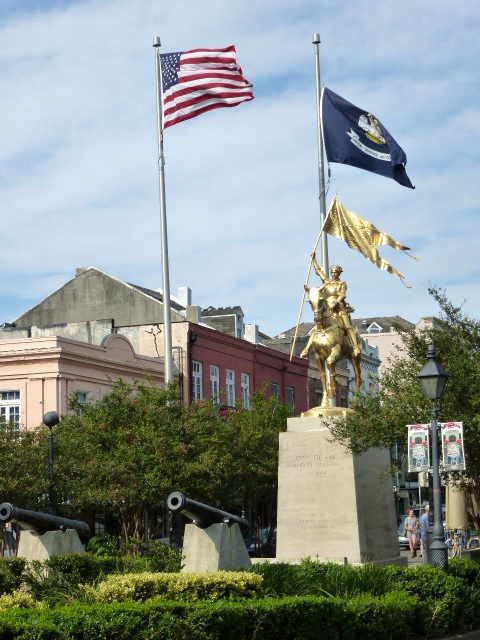 The French Quarter is well-known for its notorious nightlife, festivals, Mardi Gras, and the birth place of jazz. Car traffic down Bourbon Street is cut-off via barrier sometime around 6:00 p.m. I’m convinced it’s to keep the wasted partying folks from getting hit by a car, or better yet, save the cars from potential damage from wild revelers. As the night unfolds, so does the craziness. Eclectic might be a good choice of words to describe the Quarter….everything from red light district activities to upscale Jazz halls. This is our second evening strolling the Quarter. We start with a delicious spiked Slurpee (i.e. frozen daiquiri) in hand….come on, it’s hot out. We then return to the same restaurant where we ate last night …. Bourbon Heat. The food was so good and we really enjoyed sitting in the courtyard. Logan eats more alligator! 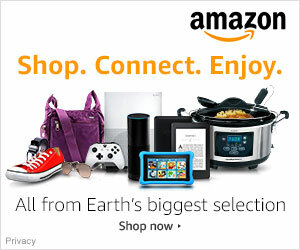 There are tons and tons of restaurant choices. Many of the places have live entertainment and at some the music can be excessively loud. The talent is obvious as music wafts the air. It’s easy to get caught up in this place. Please note; with the completion of one frozen daiquiri and the start of a second, the music and overall experience was greatly enhanced and thus highly recommended. 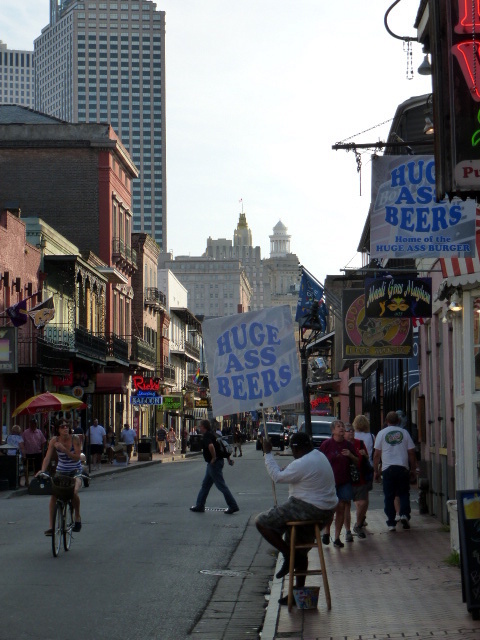 In other words, the French Quarter is a lot more fun when one is buzzed, like everyone else. We visited the Quarter on a Tuesday and Wednesday night and were back at the hotel by 9:00 p.m. (party poopers) We saw plenty of craziness during these two week nights. A sampling of some of Logan’s comments; “You got to be kicking”. “What the heck is that?” “Really?” “WTF” “OMG”. “Hum, lingerie night?” “Peep show?” “Did you see that”. Street Performer. Bucket for tips! We people watched, watched street performers, and stopped to listen to music. In the photo to the left, is a ‘street performer’, I use the term lightly. I guess his talent is climbing a free-standing ladder….a ladder to nowhere. The ladder is NOT up against anything. He just climbs and balances on the ladder. Okay, moving on. Later in the evening, down the street, we watched two guys street dance and they were pretty entertaining. Michael Jackson would be proud of the unique moon walk. Never once did we feel unsafe. New Orleans finest were plentiful, patrolling by car, on motorcycle, and on foot. These officers were regularly engaged in conversation with locals…..very friendly and civil. There were times it was all Logan and I could do not to stare or open our mouth in shock. We can’t fathom what it’s like on a weekend or let alone Mardi Gras. Party Central is putting it mildly. 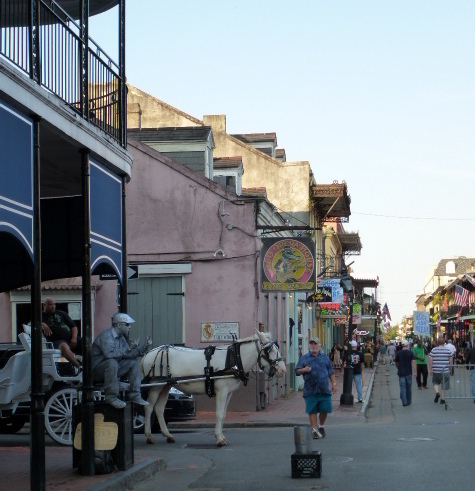 Everyone should experience New Orleans’ French Quarter, at least once. I’m glad we did, even though my behavior, in comparison to others, could more easily be associated with a nun…..not so bad, considering this is Catholic country after all…..
October 4, 2012 September 29, 2012 by Ingrid14 Comments on Can you say Yum? It’s been a long day. 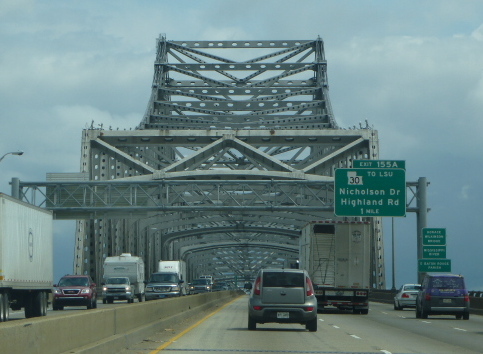 We drove from Shreveport, Louisiana, to New Orleans. We took a short break settling into our hotel room before walking down Decatur Street. 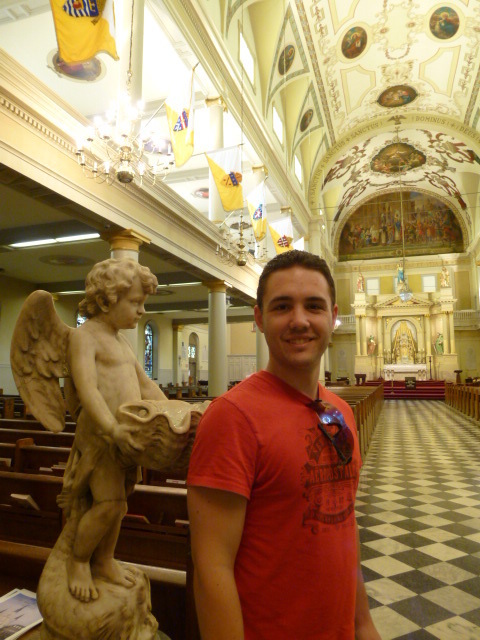 We visited the historic St. Louis Cathedral and viewed the Mississippi River. I think it’s high time for dinner and drinks. 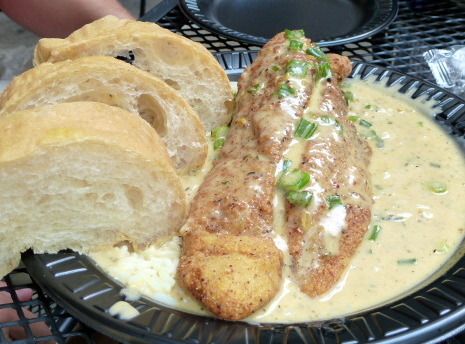 What better place to enjoy a yummy New Orleans meal than the French Quarter….Bourbon Street to be exact! 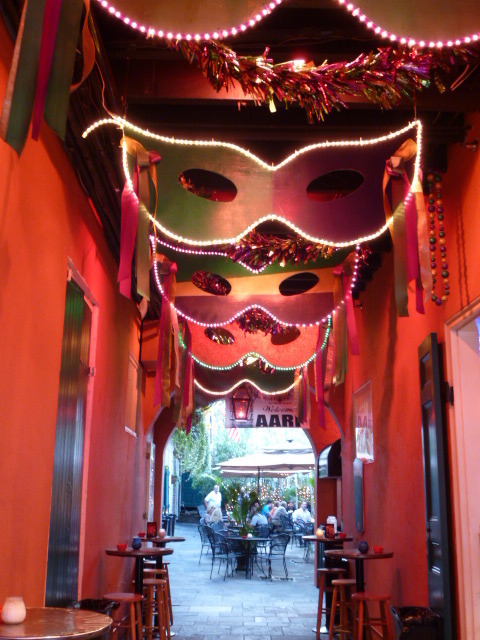 From Decatur Street, we take a little side street and walk slowly over to Bourbon Street. We take in all the sites, sounds, history, architecture, and atmosphere. Logan has never seen such narrow streets or such old buildings. 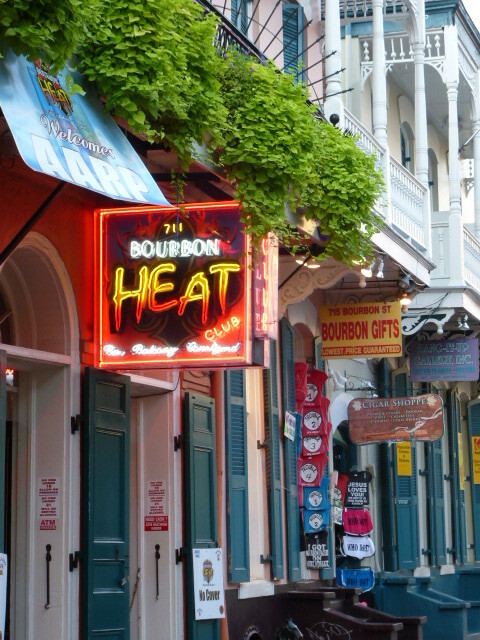 We round a corner and there’s no doubt when we reach Bourbon Street. Neon lights, music, and activity abound. As we continue down the street, the sound of music becomes a main component. It’s still early….perhaps 5:30 p.m. and we’re hungry. We read some posted menus to see what we’re in the mood for. Logan reads “alligator sausage” and immediately says, “I gotta try alligator”. 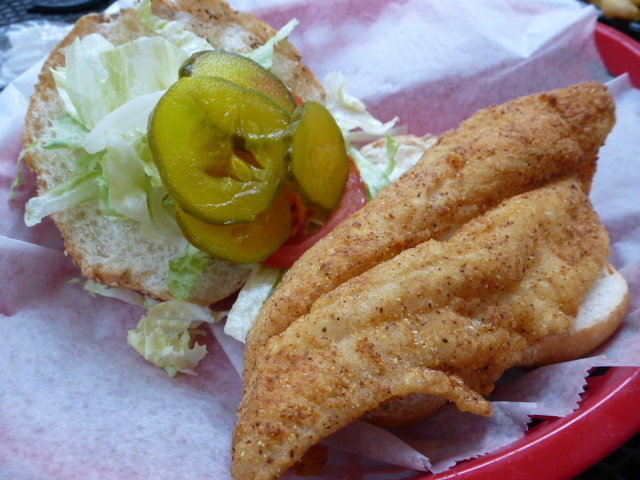 So alligator it is. The name of the place is Bourbon Heat. It’s more bar than restaurant but a walk- way toward the rear of the building reveals a courtyard. We grab a table and order the house drink. 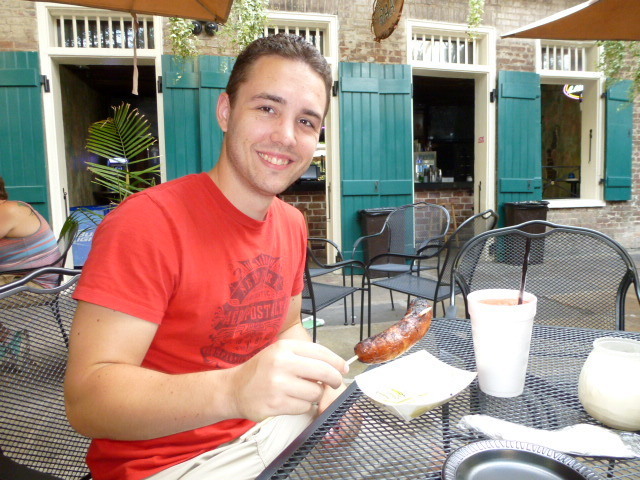 When I say house drink, I believe it’s more of the popular drink here in the French Quarter…….frozen daiquiri’s. These “ice-e” machines are everywhere making frozen daiquiri’s and margaritas served in ‘to go’ cups. My kids and I are huge Slurpee fans. So these frozen strawberry daiquiri‘s hit the spot. was simply delicious. The atmosphere was exactly what we needed….simple, casual, laid back. The food is served on paper plates with plastic utensils. Our daiquiri’s are served in large styrofoam cups, making it very convenient for drinking ‘on the go’. We are quickly reminded to slow down while slurping this yummy concoction…..brain freeze! After devouring our meal, we slowly meander our way back to the hotel while drinking our spiked slurpees. 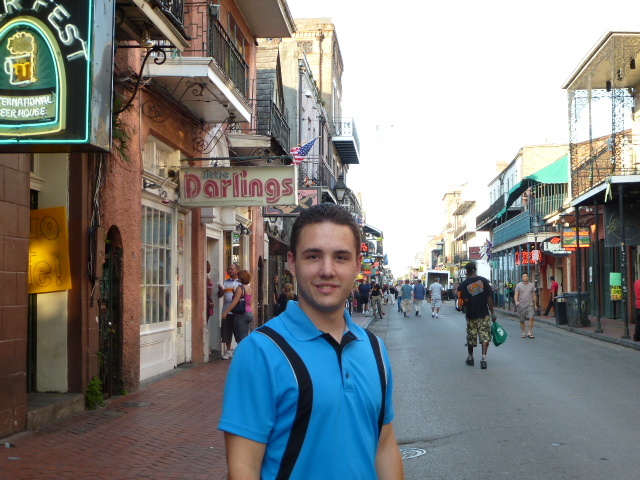 The French Quarter………I’m speechless! I thought I saw it all while living in Las Vegas, Nevada. I’m not kidding when I say “I’m speechless”. 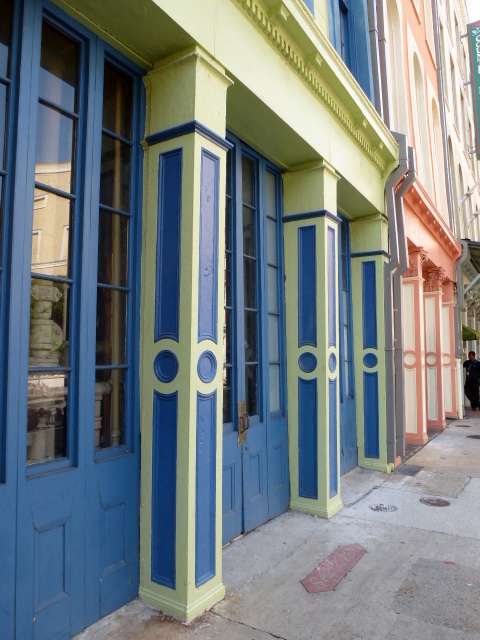 I need to think about putting our short visit to the French Quarter into words……. After traveling 1220 miles in a day and a half, about 21 hours on the road, Logan and I are ready to stop driving. We pull up to the front of the hotel, pop the trunk to retrieve our luggage, and are suddenly and unexpectedly startled by a stow away jumping quickly to his freedom. A Texas cricket moves to New Orleans! We get settled into our hotel room, leaving Jiminy Cricket to find his own quarters. We are very pleased with the accommodations and the location of our hotel. I booked us via the internet at the Blake Hotel New Orleans, located at 500 St. Charles Ave, New Orleans. Prior to our departure, I spend well over an hour on the internet doing research for a place to stay in New Orleans. I pick The Blake Hotel. First, it was close to the seminar held at the Inter Continental Hotel; the whole reason behind this trip. Second, the price was right at $85 a night. Third, it’s a member of the Choice Hotel family, allowing me to acquire choice privilege points. Parking cost another $25 a day, but hey this is a major city after all. At the front desk we obtain a free map of the local area. Still using those paper maps even though son and I both have smart phones. 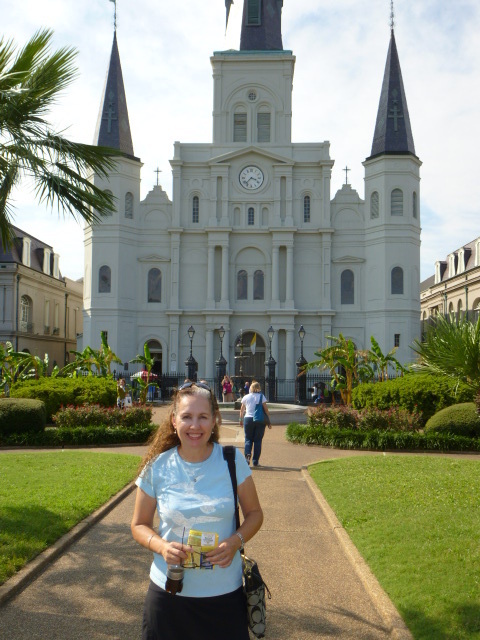 First stop must be the St. Louis Cathedral. Regardless of ones religion, this is a must see on any visit to New Orleans. 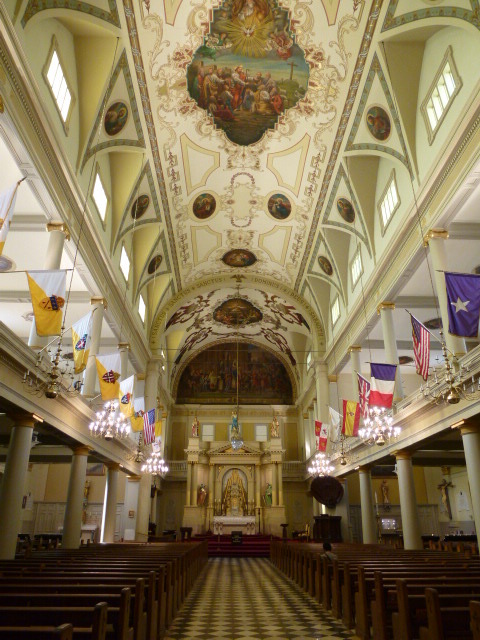 The St. Louis Cathedral is the oldest active Catholic Cathedral in the United States. 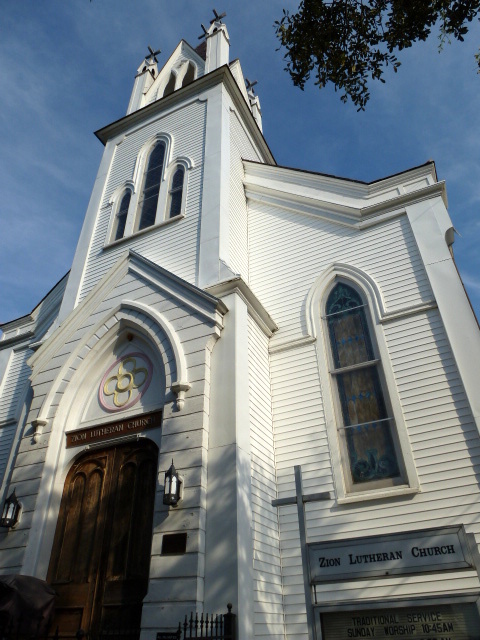 The history of this church dates back to the 1700’s. Cathedral-Basilica of St. Louis King of France was founded in 1718 and established as a Parish in 1720. 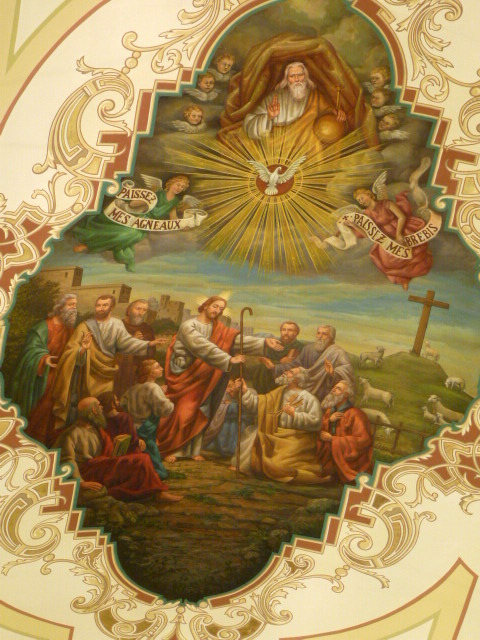 It was designated a Basilica in 1964. Logan and I are in awe from the stained glass, to the statues, and the hand painted walls and ceilings. We’re moved by the history, spirit, and faith invoked by this incredible structure. It boggles the mind to know this current structure has stood here since 1794. Boy, I don’t feel so old after all. We explore the exterior grounds. The garden is lush, green, and meticulously maintained. Logan is a bit of a history buff (like father, like son) and is totally enthralled with the history surrounding us. 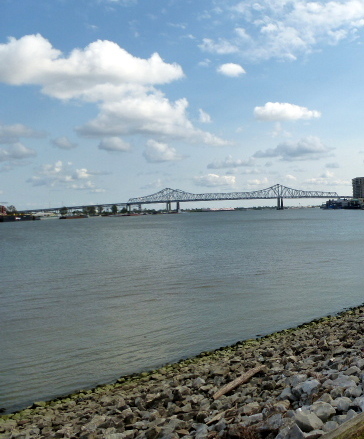 We cross Decatur Street and find ourselves along the shores of the Mississippi River. It appears the river is low despite Hurricane Issac. There is no boat or barge activity. So we assume the river is still closed to shipping due to the drought up north. 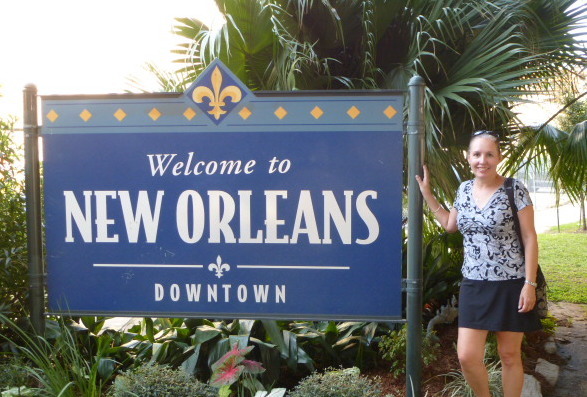 It’s time to head to Bourbon street and find some yummy Cajun food…..
September 30, 2012 September 28, 2012 by Ingrid14 Comments on Are We There Yet? Son and I wake early and rested. We slept great and are ready to get to our destination. New Orleans here we come! We grab some coffee and bananas ‘to go’ from the breakfast bar; included with our room. We’re anxious to hit the road. 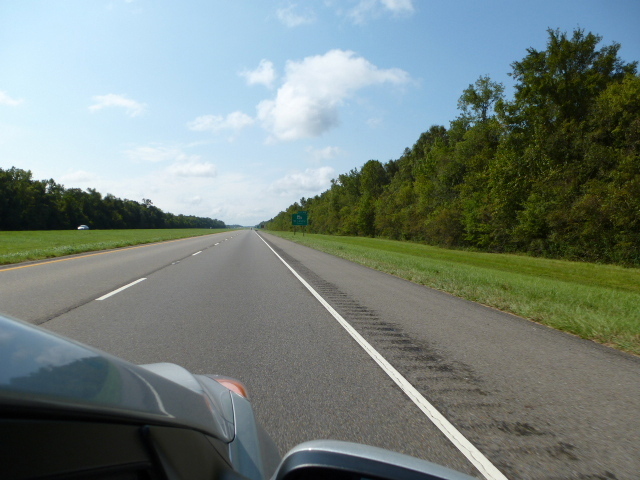 We’re heading south from Shreveport, Louisiana, on Interstate 49. Son is intrigued with the lush, green landscape, and the flatness. There’s little to no traffic and we enjoy the drive taking in the environment. After about an hour into the drive, we stop at McDonald’s for more coffee and a couple of McMuffins……one of my travel vices. The McDonald’s is busy. Folks are jovial, engaged in conversations, and extremely polite. Once again, son and I question what country we’re in. We focus really hard to understand this interesting form of English and even then we’re not sure what was said, but everyone is helpful and happy. A smile, nod, and a thank you on our part seems to work, even though we’re not sure what we’re responding to. Did I already mention how polite everyone is? 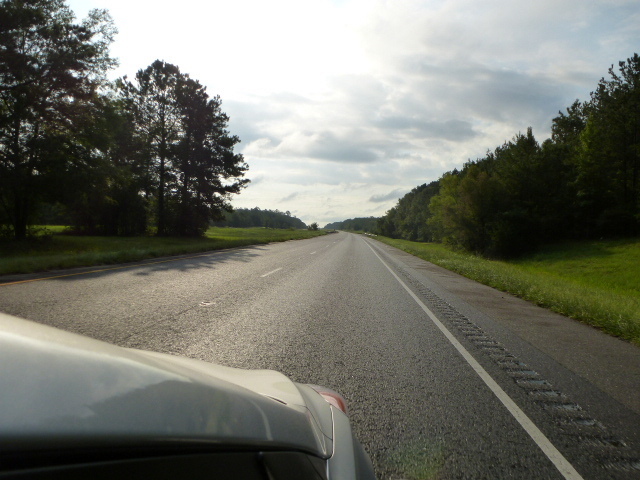 We continue south on I-49 to the city of Lafayette at which point, we head east on Interstate 10. It was after Baton Rouge where the drive got interesting. 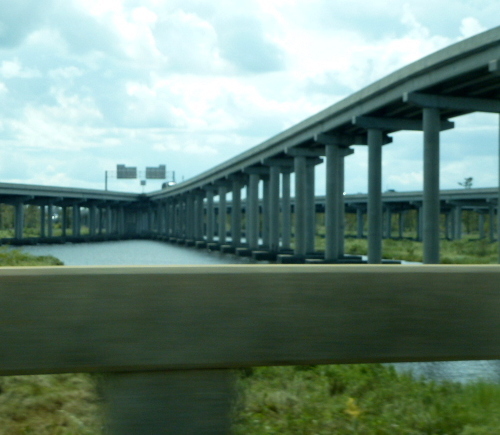 We experienced driving via a Causeway over swamp land…..water, water and more water. No drought around here, that’s for sure. 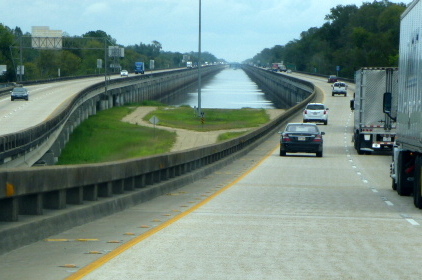 This Causeway, a long series of bridges, and the swamp water all around was definitely unique. I drive so son can look around. He’s excited and in awe as he takes in the environment. We agree, we wouldn’t want to break down around here. 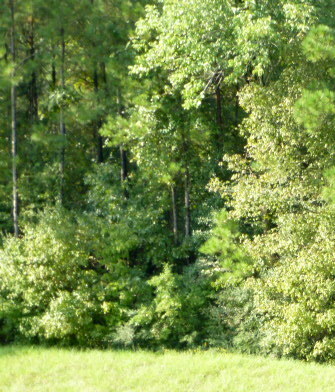 The vegetation is thick. The bugs are big (as evidenced by the yuck on the windshield). There’s water everywhere….some clear, some green, some scummy. The land is flat and the air is thick. Louisiana and Colorado couldn’t be more different. 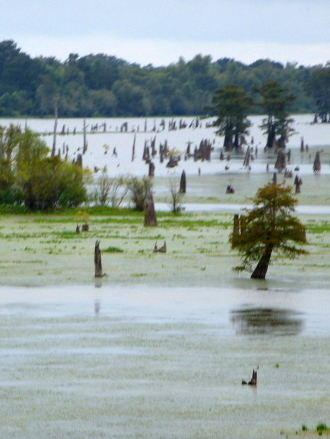 As we approach New Orleans, we witness more water. We pass Lake Pontchartrain and then the famous Super Dome. We’re here, we’re finally here. I’m driving and I’m not sure what exit we should take to get to the hotel. Our plan was to switch drivers before New Orleans, but there just never seamed to be a good place to do this. Also son was so fascinated with the surroundings, I wanted him to have the opportunity to look around without having to focus on traffic. I’m old school and don’t use a GPS. I use paper maps. However this will be changing with the addition of my new smart phone. Back to the maps….I have son grab the atlas and all my print outs from google maps for him to navigate. We pass our exit and get off at the next one. I’m pretty good with directions (I don’t get lost, just turned around) and between the two of us we find our hotel. 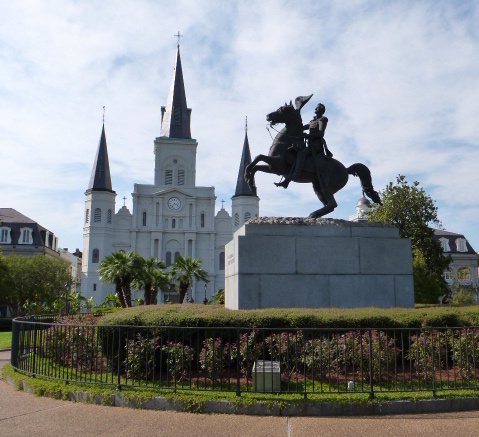 Fortunately for us, during our “turned around” drive circling some blocks, we saw parts of the French Quarter and drove by the famous St. Louis Cathedral – on my must see list. This gave us a great prospective as to walking distances for our explorations. 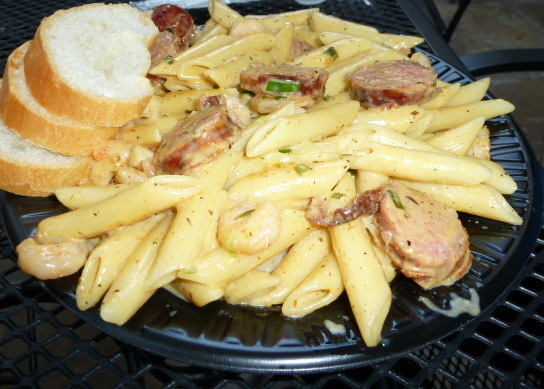 We check into our Hotel, valet the car, and head out on foot for a yummy Cajun meal…. Although I enjoy the freedom of being an empty nester, I relish visits with my children. Recently son drove in from Phoenix to visit us. Son has been researching a new career venture and wanted to run some things/ideas past his parents. I’m not sure when Al and I got soooo smart. I think it happened sometime during son’s first year in the ‘real’ world. You know, that first year after college. In the eyes of youngens, parents can’t possibly be smart or understand the life of the youth. After all, we were never young, were we? So it’s nice to know, as parents, there comes a time when we’re deemed not as dumb as we once were. As the three of us visit, we collaborate and research. We come across a one day seminar, a seminar possibly worth attending. Do I hear “road trip”? Since this is a spur of the moment decision and the price of airfare on short notice is not cost-effective, we decide to drive. Son and I hit the road in his fuel-efficient Elantra and leave Al and Bear behind. It’s early Monday morning the 17th of September. We head south on Interstate 25 to New Mexico. Once in New Mexico, we head east on Highway 87 toward Texas. There’s little to no traffic. 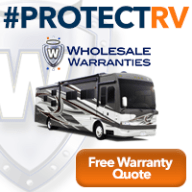 We continue east and then south toward Amarillo, Texas. 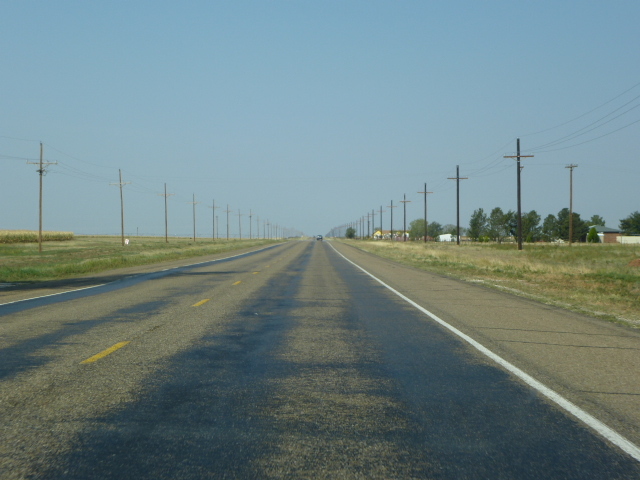 The speed limit varies from 70 mph down to 35 mph whiling traveling through small farm towns. 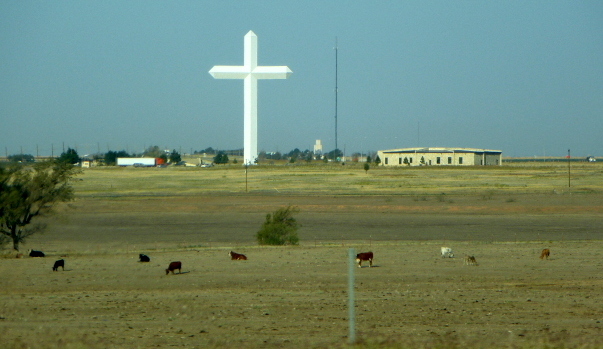 In Amarillo we pick up Interstate 40 and head east. Al and I often take I-40 west of Albuquerque on our travels between Colorado and Arizona, but this leg of I-40 is new to me. 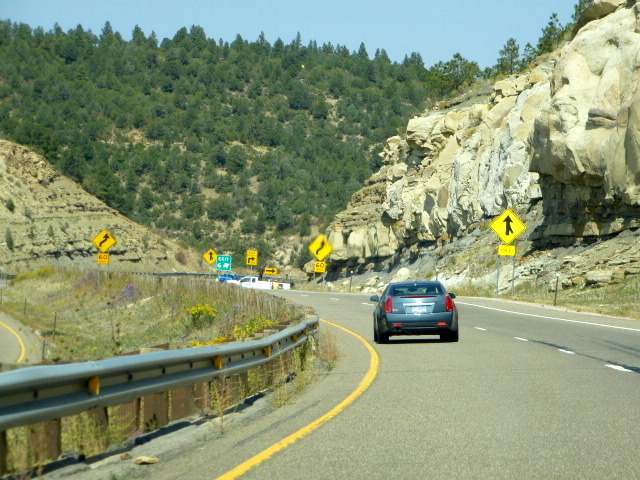 I-40 is well-known to those interested in retracing the historic Route 66, as much of I-40 is intertwined with this historic road. We continue much of the day traveling through the state of Texas. We left Pueblo West, Colorado, at 6:30 a.m. and reached Fort Worth, Texas, around 6:30 p.m. Nope, not our final destination, stay tuned. We thought we would miss rush hour traffic in the Dallas/Fort Worth area, and I guess technically we did, but traffic is still pretty crazy. At the south end of Fort Worth we head east on Interstate 20. Somewhere in east Texas off I-20, about an hour from the Louisiana border, we stop at a truck stop for food and a potty break. It’s dark. We park near a light toward the edge of the parking lot away from the congestion. We see bugs flying around in the glare of the light. As we exit the car, we are struck by the thick, moist, warm air…..humidity in all it’s glory. Our walk to the gas station building quickly turns into a run as we are inundated with crickets….crickets crunching with each foot step, crickets hitting our bodies. Yuck, we don’t dare open our mouths for fear of swallowing a cricket. Son and I make our purchases. As we exit the building, we race back to the shelter of the vehicle. It’s like a scene from a science fiction movie….Attack of the Crickets. We sit in the car a moment in shock as we listen to the crickets hitting the vehicle making the sound of hail. The windshield and car are covered in these little critters. They’re everywhere including one caught in my hair. Do I hear a eek and a scream? Up until this stop, my naturally curly hair had remained in perfect ringlets. That is until I stepped out of the car. It was just like that Fructis commercial when the gal puts her toe in the water and her hair frizzes into a do only Bozo would be envious of. So not only was I attacked by crickets, but my long, waves, and curls turned into a huge ball of fuzz from the humidity making it a perfect nest for flying crickets. Even son commented, “WTF happened to your hair mom”? Curly hair and humidity do not mesh, and we’ll leave it at that. I won’t share the stories of a tearful little girl growing up in the humid midwest in the sixties, when long straight hair was all the rage. Can I hear an “awe” or perhaps a violin playing in the background? Aside from all the creepy crawlies, the folks in these here parts, are down right friendly. However, we can’t seem to understand a word they’re saying. Are we still in America? The dialect is definitely unique. The closer we get to our destination today, the less driving we’ll have to do tomorrow. Have you guessed yet where that destination is? 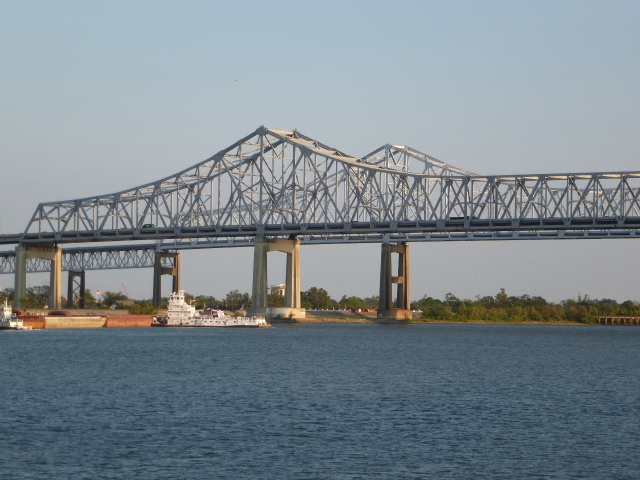 We push onward toward Shreveport, Louisiana for the night. 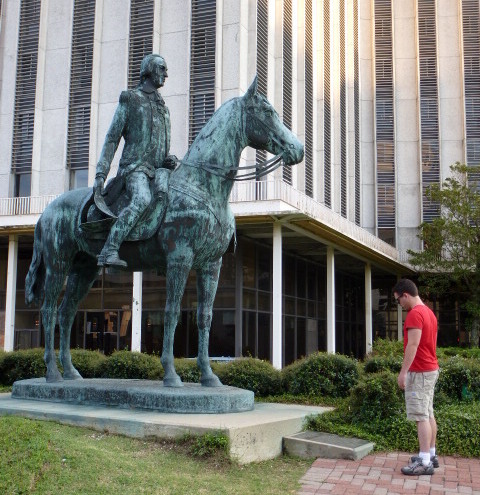 We arrive in Shreveport at 10:00 p.m. mountain time / 11:00 p.m. local Louisiana time. We find a Sleep Inn along I-20. It appears to be rather new. These two exhausted travelers are fast asleep the moment their heads hit the pillows. Tomorrow, we’ll head south for another 5 to 6 hours of driving time…….